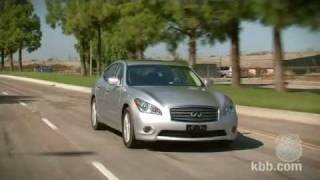 Infiniti unveiled the 2011 Infiniti M to the public at the 2009 Los Angeles Motor Show. The all-new 2011 Infiniti M37 and Infiniti M56 will go on sale across North America beginning in spring 2010. Using a 3.7-liter, aluminum-alloy DOHC V6 engine, the M37 receives 330 horsepower and up to 270 ft-lb of torque. Meanwhile, the M56 gets 420 horsepower and 417 ft-lb of torque from its 5.6-liter direct-injection DOHC aluminum-alloy V8 engine. ROLLE, Switzerland (December 2, 2009) – A new style of performance saloon – brimming with passion, craftsmanship and driver appeal – comes to Europe in 2010 as the world’s newest luxury automotive brand Infiniti faces up to the traditional executive car hierarchy for the first time. Power, performance and technology all come together with signature Infiniti sophistication in the all-new Infiniti M Line which makes its official public debut in the USA today, prior to European sales starting next September. Please note dimensions are subject to final European homologation.